Commercial Storefront service and repair is a core pillar of what we do at National Glass. For over 50 years Santa Clarita has been trusting us with their storefront needs. Next time you have a problem with your storefront call National Glass to see what we can do for you! Commercial Storefront Doors are subjected to heavy use day in and day out as well as exposure to the elements. 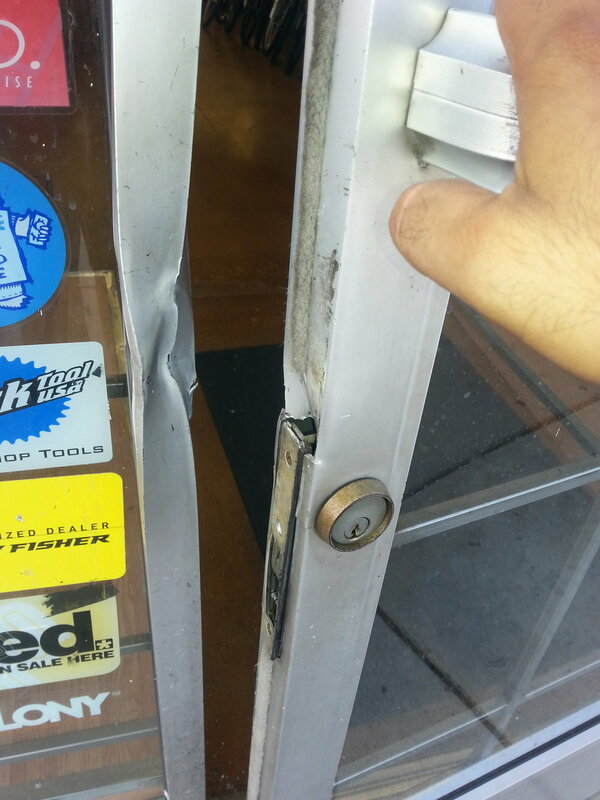 Overtime this wear and tear can cause your store front door to not be able to close or open properly. If the door to your business is not closing, locking or operating smoothly talk to us about how we can repair and service your existing door so that you can get back to business. Storefront glazing systems can leak water into the interior of a building for a variety of reasons. Our trained storefront technicians can evaluate any storefront leak, big or small, and come up with a weatherproofing recommendation. Water damage from an untreated leak can cause thousands of dollars in damage, call us today to discuss your options! This weather resistant seal on these storefront windows has fallen out, allowing air and water into the building. Tempered Storefront Window glass broken by an object impact. Storefront glass can break for a variety of reasons; robbery, vandalism, accident or anything inbetween. When you need to get a piece of glass replaced in your commercial storefront, call National Glass. We will get your business back up and running like nothing ever happened! If you find yourself the victim of a break in or robbery and need your store or home to be boarded up, National Glass offers a 24 hour emergency board-up service. Just call us at (661) 259-6444 and follow the prompts to reach an on-call board-up technician. Commercial Storefront Door with temporary Emergency Board-up.